Katsushika HOKUSAI. Fugaku hyakkei (One-hundred scenes with Fuji’s peak), Part 1, 1834. Ebi Collection, Art Research Center database, Ritsumeikan University, Ebi0381. Books figured significantly in the formation of the reputation of Katsushika Hokusai (1760–1849) among his contemporaries and subsequently in Europe and America. 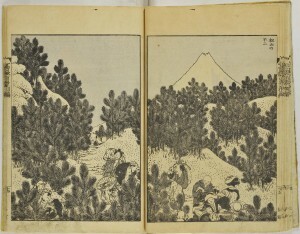 He provided illustrations for over 260 titles, encompassing novels, anthologies of Japanese and Chinese poetry, erotica, warrior tales, bilingual editions of Chinese classics, gazetteers, copybooks for aspiring artists, pattern books for artisans, model letter books, dance manuals and picture anthologies. For many decades after his death, publishers kept his books in print and even issued posthumous titles to cash in on his marketability. This course will consider Hokusai as a publishing phenomenon. His achievement as a book illustrator—and print artist—will be situated squarely in the world of Edo-period publishing. We will examine his relationship with publishers and the ways in which they marketed his books. The process of book production will be explained in order better to understand his use of the printing technology available to him. Multiple copies of selected titles will be examined to demonstrate the ways in which publishers exploited woodblocks over many decades. Books illustrated by Hokusai’s predecessors and contemporaries will also be studied in order to identify the features that distinguish his work. Finally, the reception and influence of the artist and his books in the West will be considered. In their personal statements, prospective students should describe any previous background they have had in the field; no previous knowledge of Japanese art or history is required of those who apply for admission to this course. The course is aimed at a broad constituency, including (but not limited to) students of the book, conservators, curators, collectors, librarians, artists, designers, and art historians. It should be of interest to anyone interested in books as objects, as commodities and/or as works of art. The Freer-Sackler Gallery possesses an outstanding collection of books by Hokusai and his contemporaries, making possible the combination of lectures and discussions with sessions in which the books themselves are studied in detail. Use will also be made of online and other digital resources. In order to make the most of the latter, students are encouraged, if possible, to bring a laptop with them. Ellis Tinios taught this course.